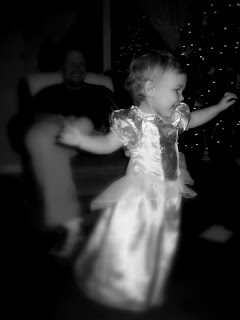 The Value Of Cheerfulness: I heart twirling. 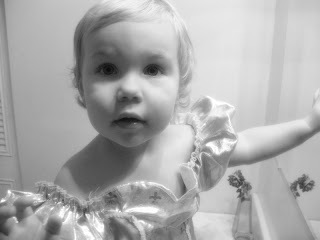 and she quickly transformed in her shimmering dress, into a twirling princess of great beauty. It's moments like this that it hits me. I am seeing more of the little girl peeking out of and less and less of the baby every day. If life came with a pause button, I'd be pushing it right now. Or even a SLOW DOWN button. That would do nicely as well. Anyone know where I can find one of those? Anyone? Oh Chelle so endearing.. and like the office max easy buttons... if it were so simple we could just go and purchase it. We had a moment like that last night too, when we were both in the living room cheering with all our might for the bug to crawl, and watching Nick down both knees with probably the biggest smile I have ever seen. Watching the loves our lifes be pappas is pretty great.... That smile in the background on David is looking pretty huge. So so sweet! And I agree- if only there were a way to slow these precious days and time down. And I too love seeing my man with my kids- definitely makes me love him all the more :) Oh, and of course, I have to mention that my little girl is completely in love with dressing like a princess as well! How sweet! You can remember these times especially when going throught the terrible two's and the annoying teenage years! simply adorable pics...you can see the twinkle in her eyes in the first and the sheer pleasure of dancing for daddy in the next! thank you for letting us peek in your world!